The Mamquam River Watershed flows from the Mamquam Glacier ice field high above the community of Squamish, into Skookum Creek, Ring Creek, Mashiter Creek, and many other smaller tributaries before draining into the Mamquam River along the valley bottom. Prior to the 1920s the Mamquam River flowed directly into the Howe Sound on the east side of what is now Downtown Squamish where the Mamquam Blind Chanel (below) is today. An arm of the Mamquam River also extended from the north end of the Blind Channel at the Squamish Adventure Center, west under highway 99 through what is now known as Dentville and drained into the Squamish River Estuary. Squamish Nation originally had a village on the former island that has now become the Squamish Adventure Centre. ​In 1921 the lower portion of the Mamquam River, just north of Brennan Park Recreation Center was dyked and the river re-directed to drain into the Howe Sound via the Squamish River on the west side of town. This dyke facilitated the development in Squamish's valley bottom and dried out tidal channels, wetlands and critical spawning habitat in the area. The line in blue on the adjacent map shows where the Mamquam River once flowed, and where water has been re-introduced through the Mamquam River Reunion Project. In the Squamish Salmon Recovery Plan, lack of access to habitat that the lower portion of the Mamquam River once provided was outlined as a critical limiting factor in Squamish salmon populations. These tidal and freshwater streams, channels, ponds and wetlands provided over wintering, rearing and spawning habitat for coho, Chinook, pink, chum salmon, as well steelhead trout to grow and prepare for their years at sea. Develop a consistent flow from the Mamquam River onto its historic floodplain which would allow for further rehabilitation of potential fish habitat downstream and also allow for juvenile and adult salmonid migration between the Mamquam River and these previously isolated habitat areas. To provide stable spring-summer rearing habitat for coho and chinook salmon and steelhead trout. Provide channel and flow connections between now isolated channels within the Mamquam and Squamish River floodplains and the Squamish River estuary through the provision of fish passage through linear corridors such as roads, recreational trails and fields, and railway lines which presently limit the movement of fish to their critical habitats. In 2005, the SRWS secured funding and approvals and began work on the Mamquam Reunion with the installation of an intake structure at the north end (yellow star in Figure 2.) followed by a second intake across the Centennial Way flood dyke in the spring of 2006. The connector channels, Brennan, Pelk-WILEM, Ballfield Channel all provided flows south. New culverts were also installed across Highway 99 to provide connections with the upper Britannia Slough (just south of the Mountain Retreat Hotel) and the Mamquam Blind Channel / Wilson Slough. Kiewit and the Sea to Sky Highway Improvement Project provided an additional Highway 99 culvert crossing and CN Rail installed an intake structure and connection from Wilson Slough into the Central Estuary Channel. ​The SRWS worked with land owners, the Squamish Nation, District of Squamish, Department of Fisheries and Oceans, B.C. Ministry of Environment, Environment Canada, and the Sea to Sky Highway Improvement Project on the development of the Mamquam Reunion Project. Figure 2. 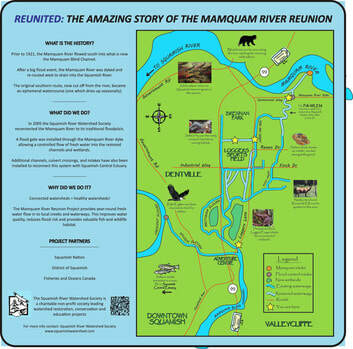 A map of the Mamquam Reunion project with restoration timelines. Re-establishment of this critical spawning and rearing salmon habitat has resulted in salmon, and other wildlife now thriving in these urban streams. In fact 2013 saw the best Pink Salmon return to the area in over 50 years in part due to the access to critical habitat achieved through the Mamquam River Reunion Project. The SRWS continues to lead various vegetation and habitat enhancement projects in the Mamquam Reunion Project area.